FreedomWorks' activists look on as Rep. Mick Mulvaney (R-S.C.) signs the Pro-Growth Pledge. Rep. Mulvaney joins Reps. Ron DeSantis (R-Fla.), Randy Weber (R-Texas), Barry Loudermilk (R-Ga.), John Fleming (R-La. ), David Schweikert (R-Ariz.), Mark Meadows (R-N.C.), Paul Gosar (R-Ariz.), Dave Brat (R-Va.), and Mark Sanford (R-S.C.) as signers of FreedomWorks’ Pro-Growth Pledge. The full text of FreedomWorks’ Pro-Growth Pledge is available here. 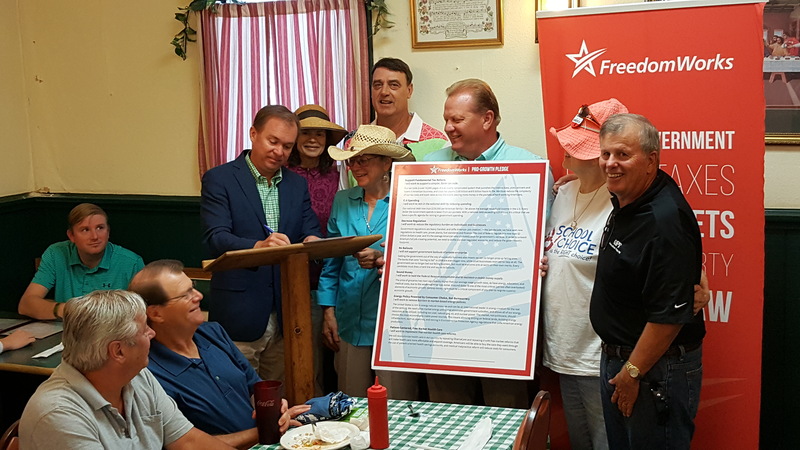 Rep. Mulvaney, who has a 94 percent lifetime score on FreedomWorks’ Congressional Scorecard, signed the Pro-Growth Pledge on Tuesday during an event in Rock Hill, South Carolina. FreedomWorks CEO Adam Brandon thanked Rep. Mulvaney for his work in Congress on pro-growth policies and fighting against cronyism. Photos of the signing are available upon request.